I visited Paris the week before last, half for work, half for play, and with clear intentions to eat some great bread, a great pastry, a Pierre Herme macaron, try a crepe and do some shopping – I am happy to say I achieved all these things and a few more. I also got to meet one of my favourite bloggers, David Lebovitz, at his book signing on Saturday evening at La Cuisine cookery school – I was probably a bit fan girl about it and I hope I didn’t come across as a weirdo (probably did). So here goes with my quick round up of a beautiful city, can’t wait to go back. I didn’t take any pictures of the meals I had during the work part of my stay but I would recommend the brilliant (and very typically Parisien) Chez Prune (36 Rue Beaurepaire, 75010) bar for atmosphere and great wine, we ate at Philou (12 avenue Richerand, 75010) one night where I had a brilliant cassoulet and we all shared a huge and delicious chocolate fondant pudding. I mostly hung around in the 10th arrondissement which is a great neigbourhood, with lots of restaurants, bars and also very chic (but sadly out of my budget) clothes stores from independent designers. On the first day of freedom (i.e. my first day in Paris when I wasn’t working) I headed straight for the bakery around the corner from my flat – Du Pain et Des Idées – I’d already walked past it the evening before and saw a queue snaking around the corner, so it had to be my first port of call. This little bakery is run by smiley friendly staff selling baguettes, breads, pastries, but with some inventive additions. I’d read up before I went along and their ‘Pain Des Amis’ seemed to be the one to try – a sourdough bread with a smoky flavour and a great crispy crunchy top. You can buy a huge loaf – which I would assume is for share with your ‘amis’ but they do also sell it in smaller portions. I also picked up a couple of L’Escargot pastries – one with pink praline and one with pistachio. I do believe they are the sugariest things I’ve ever eaten – which is brilliant. The pink praline was my particular favourite as it had a mixture of caramel stickiness and crunchy pieces of praline amongst the flaky pastry. We tried again on Saturday morning to get some croissants but unfortunately they only open Monday to Friday – next time! On the Friday evening we were both tired (in no way was I suffering the effects of too much good Bordeaux) so we just chose a bit of an unspiring pizza place across the road from our flat (Canaletto) – if you want to try a better pizza place The Pink Flamingo is fun and the American Italian owners are really nice, they have several branches in Paris (yes I ate pizza twice whilst in Paris!). On Saturday we hit Boulevard Haussmann for some retail therapy, we spent most of the day in the stunning Galleries Lafayette which is a shopaholic’s dream. The ceilings are also beautiful and even more beautiful with the enormous Swarovski crystal decked Christmas tree through the centre. We of course also went across the street to the food hall where we marvelled at all the cheese, so much cheese, along with lots of other amazing looking food. I particularly liked the little spice market, lots of spices, dried herbs, tea and even paan masala piled up beautifully ready for you to scoop up in to little bags and take home. The wine section is also a thing to behold, we browsed the vast array of wine including the impressive selection of vintage wines, one bottle was €2300! We picked up a slightly more €13 bottle of Macon Cremant – sparkling wine. Macon Villages ‘Chamorey’ wine is also excellent, we’ve had it before and it you can pick it up in Waitrose and sometimes Tesco. We also stopped at Pierre Hermé for macarons and a selection of chocolates. The display itself is as beautiful as the macarons themselves – we opted for white truffle & salted caramel (pictured), rose and yuzu, salted caramel, milk chocolate and pistachio. We decided not to go for the foie gras festive editions, he may be a master at flavour combinations but foie gras in a macaron? Hmmm. The white truffle split us – Mr hated it but I thought it was brilliant, the truffle was delicate and earthy – a little strange but I think it worked. The chocolates we took back home feature similar flavours and also some others – one of which is smoked salt – which tastes like bacon and chocolate – a bit like those brownies I made a while ago! After the book signing we headed to the trendy district of La Marais to have crepes and galettes at Breizh Cafe. I’d been recommended this traditional Breton cafe by a friend and been reassured it was very authentic and many of the ingredients sourced in Brittany – also crepes are great if you are with a vegetarian. It’s tough finding veggie food in France! I started with a Kir Breton (breton cider and cassis) which is something I’ve never heard of and it works really well, something I am going to recreate at home. I had a galette (the difference between a crepe and a galette is that galette is made from buckwheat flour, whereas a crepe from regular wheat flour) with ham, gruyere cheese, a soft egg and confit onions. The confit onions were my favourite part, so sweet and savoury at the same time, I also enjoyed the dippy egg and galette combo! Mr had a goat’s cheese galette which came with a large serving of creamy goats cheese, salad and more of those confit onions. 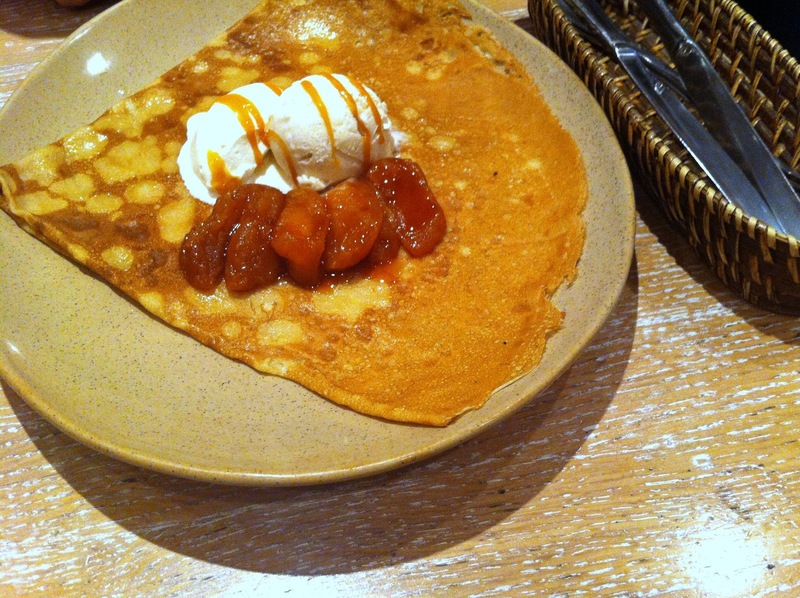 The pudding was the real star, we shared a tarte tatin crepe made with the most amazing caramelised apples I’ve ever had. The apples were infused with vanilla and just a little spice and I think either cider or apple juice – they were gorgeous with the light crepe and homemade ice cream. I kind of wished we hadn’t decided to share a pudding! For our last day, Sunday, I had plans to visit Saravanaa Bhavan, a vegetarian Indian restaurant just near Gare du Nord. The restaurant was absolutely heaving when we arrived about 12.30, we were told to find a seat where we could, and ended up sitting with others which totally does not appeal to Brits, but it was quite good fun in the end. It was chaotic but the atmosphere was buzzing – full of families – Indian and French, tourists, people alone getting a taste of home. A great place to people watch. We were planning to eat lightly before we got the Eurostar that evening, so we went all out for lunch. We both ordered a dosa – a classic masala dosa for me and a paneer dosa for the Mr. Both were very very crispy, freshly made with a great spiced potato filling and the accompanying sambar, coconut chutney, chilli chutney and dahl were all perfect. After that we shared a ‘North Indian Thali’ which contained dahl, mushroom curry, rice, potato curry, spinach curry, raita, papar, poori and finally a sweet – sooji. They have restaurants all over the world – including London and randomly Ilford which isn’t too far from home! After our meal we caught the metro to the Champs Elysees and walked down to the Arc du Triomphe including Jardin des Tuileries. There is a very touristy Christmas market down there where we had some pretty bad churros, I’m sure there are better Christmassy things to do in Paris, I would avoid that. The shops, however, were great and I managed a little more shopping before we had to catch the train back to London.